One day after New York City’s The Daily News, the fourth most widely circulated daily newspaper in America has jumped on the anti-gun bandwagon. Yesterday the newspaper infuriated right wing with the headline “God Isn’t Fixing This” mocking the false prayers and condolences that GOP politicians have made after the recent epidemic of mass shootings. 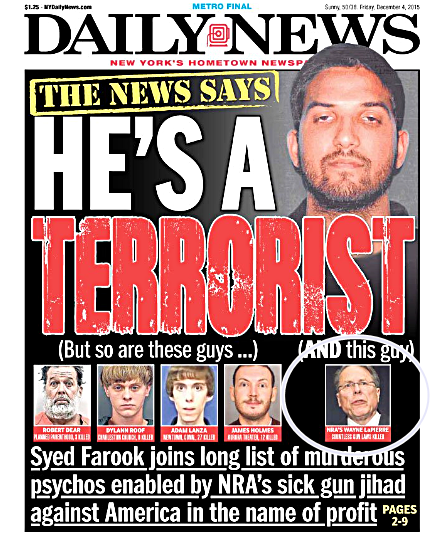 Today The Daily News went one step further and listed NRA President Wayne “Jihadi” LaPierre in a front page photo panel of infamous terrorists. While many most will probably dismiss this as just a way to sell more papers – Ratcheting up the rhetoric for gun control is what we need to match the rhetoric that the NRA uses. And Back2Stonewall.com applauds The Daily News for doing so.